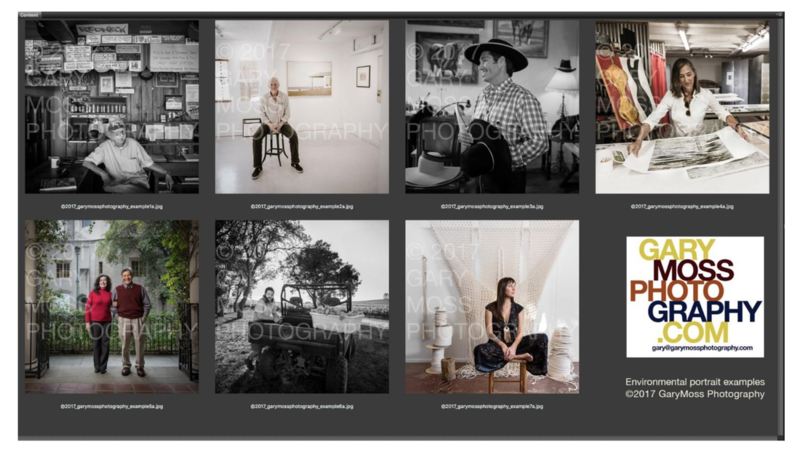 Gary, an Art Center graduate and teacher at Brooks Institute of Photography, is an accomplished award winning professional photographer who is the Photo Editor of 805 Living magazine. He is a passionate teacher who conducts workshops for all levels of photographers. Gary's mission is "to teach amateur and emerging professional photographers the skills required to take pictures filled with creative visual impact...". Visit www.camerawhisperer.com to learn about his workshops and seminars. You can also find him at www.garymossphotography.com. It’s a photo that tells a visual story of the subject’s workplace, home, or anywhere they like to spend their time. It conveys a moment that captures who the subject is and what the subject does. Is subject choice vital to the success of this assignment? Absolutely. Your choice of content in the environmental portrait should create a visually engaging photograph. The subject’s environment is just as important as the subject. Try to choose a subject who comes with a visually interesting environment. I’d like all members to really think about this assignment (visually) and select the right subject/environment. I understand some have more setup time to find the right subject, while others may choose an existing photo taken on vacation or photo tour. My advice: Give yourself time to think about your photo shoot. Ask yourself, what is it you’re interested in photographing? Do research wherever and whenever it feels right - it may be online or while you’re driving around. Look for places in your neighborhood that you see repeatedly, but have never thought about for a photo assignment. Get the most out of these assignments by shooting ORIGINAL photography. In the long run, you will be rewarded by your efforts. Research for inspiration. Know what you’re going to shoot and how you’ll shoot it and it will show in the final product. Take chances. Please show creativity! Don’t just shoot the same old “knee jerk” response to assignments. Styling, Makeup, Grooming, Wardrobe. Make sure the subject looks camera-ready and groomed. Pay attention to these details by communicating with your subject. Tell the person what to wear. Make sure clothes are pressed, hair looks good, and facial make-up removes any shine. Technical skills. Must be spot on. Even if your assignment falls short on creativity, you must still show off your skills as a photographer. Lighting, composition, styling, processing, color correcting, retouching, cropping, printing and display of final work are vital to a successful shot. Always good to have model/minor releases with you. You can download pdf hard copies but I use this great app for your mobile phone.